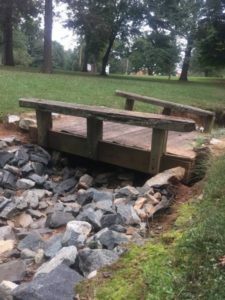 Years ago, a bridge was installed across the drainage ditch that cuts across the yard between the Meeting House and the intersection of College Road and Friendly Avenue. The ditch, deep in places and lined with riprap, carries runoff from College Road into the city’s storm drain system. Now the city is about to make improvements to the waterway, and the bridge needs to go. If you or someone you know has a use for the bridge, it is available at no cost.